With over fifty years experience in wire drawing and a yearly output of almost 50,000 Tonnes, Sidergas is a leading European manufacturer of carbon steel and aluminium welding wires, whose remarkable high quality is recognized and confirmed by important International Certification bodies. Sidergas is committed to continuously develop innovative products and technologies aimed at effectively satisfy the growing industry demand for reliable welding consumables in welding automation and the increasingly stricter work safety standards. Thanks to a constant interaction and cooperation with selected end-user customers and distributors worldwide Sidergas has, year after year, succesfully managed to expand its production facilities and business volumes. 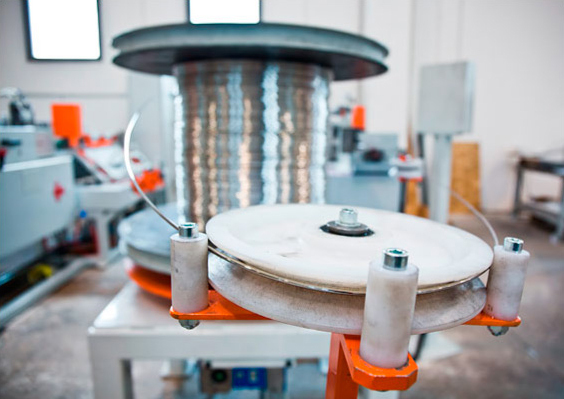 We start with sourcing our greenrod from selected European and North American mills according to tighter specifications than the Industry standards, we store it in a carefully controlled environment and subsequently we process the wire using proprietary sophisticated drawing and winding technologies. The quality and consistency of our products is verified by internationally recognized approving organizations and appreciated by our end-user customers worldwide. Besides the advantage of a consistent welding wire quality, our customers can enjoy the reliability of a superior packaging which allows them to maximize and maintain the performance and productivity of their welding systems. To achieve this, we have built our own twist-free winding machines and developed our own proprietary twist-free winding technology and we have coupled it with patented innovative bulk packs. The positive feedback from our clients further encouraged us to work on the development of auxiliary professional solutions for a more effective guidance and transport of welding wires in robotic and automatic applications. SIDERGAS participated in a POR FESR 2014 - 2020 notice acquiring a system for cutting and tracing of aluminum rods for welding, making use of the POR - Objective "Investment in favour for growth and employment". Starts FESR european fund of regional development 2014-2020. The project implemented allowed the introduction of two new machines for cutting of aluminum wire rods intended for TIG welding and the insertion of a new hardware/software platform for the advanced management of the product traceability with the aim of optimizing the production process and increasing the quality of the finished product also through a timely recording of production data.